Mosquito bites are fairly common, but don’t tend to cause many problems in the UK. However, in some parts of the world, they can pass on a range of serious diseases, like malaria. They usually cause small red lumps to appear at the area of the bite and can be very itchy. In some cases, blisters filled with fluid can also develop. If you’ve recently been bitten by a mosquito and have developed symptoms like a headache, fever or nausea and vomiting - you should see a doctor as soon as possible. Only female mosquitoes bite people, with male ones happy to feed on nectar from flowers. The females require blood to develop properly and lay their eggs. On their own, mosquito bites are mainly annoying - causing itches and in some cases, blisters. However, when feeding on animals they can become a carrier for a range of diseases, which can be passed on when they bite humans. These can include serious conditions like malaria, dengue fever, encephalitis and the West Nile virus. On their own, mosquito bites don’t pose much of a problem and can usually be treated with over-the-counter cream to reduce itching and inflammation. However, if you’ve recently travelled to an area that’s known for mosquito-borne diseases and you develop any worrying symptoms or infectons due to a bite, you should see a doctor as soon as possible. 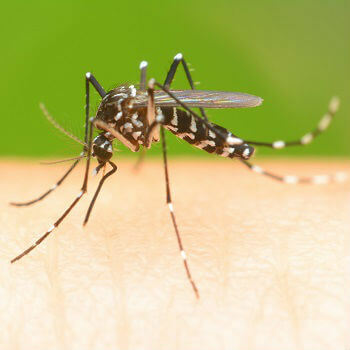 Treatment will depend on what disease the mosquito may have passed on to you, or whether you’re experiencing an allergic reaction in response to the bite. If you’ve been recently bitten by a mosquito and have gone on to develop any symptoms you’re worried about - speak to a doctor online now. Our GPS can examine the affected area, diagnose your issue and if necessary, prescribe medication to help treat your condition.